Koneser is the talk of Warsaw! Warsaw’s Praga District has been chosen as one of the 10 Europe’s coolest neighbourhoods (The Independent, 2018). Right in the very heart of Old Praga, on revitalized premises of the former Warsaw Vodka Distillery, sits Centrum Praskie Koneser – a bustling urban quarter brought back into the capital’s life. The focal point of this post-industrial space is Koneser Square, accessible to the general public. 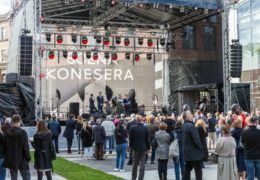 It was solemnly given back to the city and its residents on Saturday, 29 September 2018, during the first edition of Warsaw Koneser Festival. Open up, Sezam! The iconic store “Sezam” in Centrum Marszałkowska is welcoming Warsaw residents again. On 6 June, we had the pleasure to witness a truly grand opening of the “Sezam” store in Centrum Marszałkowska. 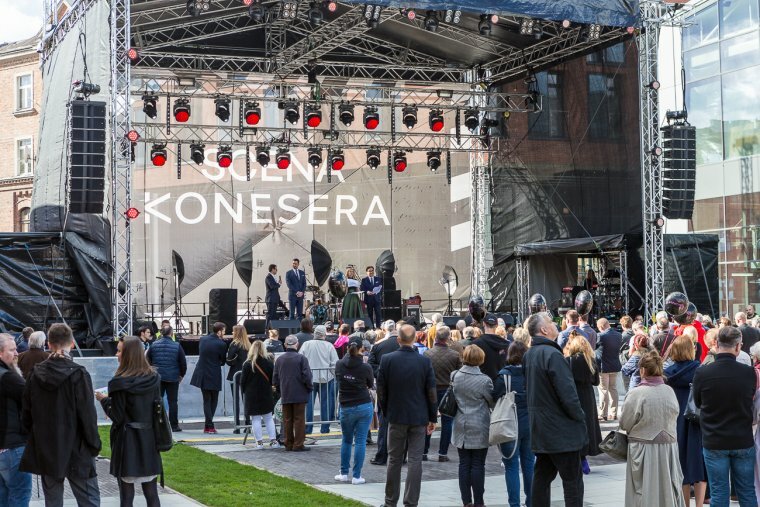 The event was accompanied by the inauguration of the retail and services part of the building as well as the unveiling of a plaque commemorating Witold Rowicki, designed by a renowned graphic artist – Andrzej Pągowski. BBI Development S.A, an official partner of the stand of the Capital City of Warsaw during the MIPIM 2018 in Cannes, is the only investor in Warsaw that will present three projects located around Plac Defilad during the largest European real estate fairs starting on March 13th. The mounting of the perch at Centrum Marszałkowska has officially started the countdown until the opening of the best-located office and commercial building in Warsaw, sited at the junction of two largest arteries – Marszałkowska and Świętokrzyska Streets. On the anniversary of the biggest real estate fair in Europe, EXPO Real 2017, BBI Development S.A., as an official partner of Warsaw, will present as the only investor in Warsaw its three flagship projects realized in the very centre of the capital city as well as one changing the face of Praga district: namely two iconic skyscrapers – ZŁOTA 44 and Roma Tower, a unique office and retail space – Centrum Marszałkowska and a multifunctional complex – Centrum Praskie Koneser. The prestigious company joins other tenants of Warsaw’s Centrum Marszałkowska, a project implemented by BBI Development S.A in cooperation with WSS Społem Śródmieście. The office and retail building located at the intersection of Marszałkowska and Świętokrzyska streets, integrated with the second metro line, has just reached the status of ‘raw state of development’, and will be available for use in April next year. Four new office space lease agreements include over 3,400 sqm. Plac Konesera will come to being. A new place in Warsaw approved by Warsaw City Council. Robert Lewandowski, a captain of the Polish representation and one of the world best football players, emphasises that he has been enchanted not only by luxurious interiors at Złota 44 and an outstanding quality of furnishing, but mostly by the recreational and sports area that is not offered at any other apartment building in Poland and Europe.